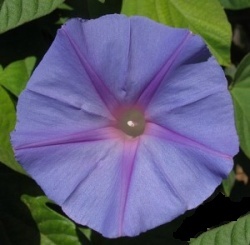 Morning glory (Ipomoea) is a fast growing annual vine with lush dark green heart shaped leaves. Being vigorous growers with a twining habit, they can quickly reach 15 feet or more which makes them ideal to cover trellises or chain link fences. They can also be used in window boxes or hanging baskets for a beautiful cascading mass of color. Plants produce showy fragrant trumpet shaped flowers up to 3 inches in diameter. The blossoms open early in the morning and usually close by mid-day. Morning glories are very prolific and will continue blooming from early summer until a killing frost. In addition to the traditional sky blue, morning glories are available in shades of pink, purple, red and blue as well as white and striped varieties. Because morning glories resent transplanting, sow seeds directly where plants are to grow. Plant 1/2 inch deep and six inches apart early in the season after all danger of frost has past. To hasten germination, soak seeds one to two days before planting. Seedlings should start to emerge within a week to ten days. Be sure to select a spot where they will receive full to partial sun. They are not particular and will grow happily in any type of well drained soil. Avoid over watering and don't be too generous with fertilizer as this will cause production of lots of foliage and few flowers. Plants will readily self seed and you will see volunteers come up next season. You can also save seeds by harvesting them from seed capsules once they are fully matured and have become dry. Morning glories are relatively pest free except for occasional chewing insects, but their roots are susceptible to nematodes in areas where they are prevalent.